to her by a story I saw in the Washington Business Journal. I give them credits, and I was so impressed with this young lady, with her face and her demeanor and the fact that she was working for an organization I’ve heard of all my life, had no idea what they were doing. But I knew about Georgetown ’cause that’s where our offices are. So I walked down the street and walked in this building, and said, “I’m here to see the new head of the Junior League of Washington, Tycely is the one.” And Tycely Williams, welcome to Our Town. Tycely Williams:	Andy, thank you for having me, and thanks for the kind words. That really means a lot. Andy Ockershausen:	Well, you know, seriously, that’s how I discovered you and how important … I had no idea what the Junior League was doing. Andy Ockershausen:	I think I’ve talked to you about that. My image of Junior League goes back 50, 60 years, but I thought it was a very, very volatile group of lovely women that met at the Mayflower and had teas. And they had a lot of involvement in the city. I knew that, and I knew about the building in Georgetown. Andy Ockershausen:	And to be in Georgetown, I think, is a coup. Tycely Williams:	Yes, it’s fantastic. Andy Ockershausen:	And to find out the Junior League is down the street from our office is opened the door for me, and I found out a lot about you by doing that. I’m so delighted that you are Junior League. Tycely Williams:	Aww, Andy, thanks so much. It’s been a great opportunity to lead the organization. I’m learning a lot, and I’m having the opportunity to connect with people within Our Town that are doing great works. So it’s just a really exciting time to lead an organization that’s focused on volunteerism and developing the potential of women because that’s who we are, and that’s what we do. Andy Ockershausen:	It’s more important every day, Tycely, and what I discovered about you is that you were the first woman, or female, or girl of color to head this organization. And I am so delighted for them to have you because I know what you bring to it. Andy Ockershausen:	You bring a difference, and differences are important. I really believe that. Tycely Williams:	Absolutely. The organization is celebrating 106 years of service this year, and we are all collectively excited about the opportunity to have a woman of color leading the organization. Like you said, diversity exists in various forms. So also within the Junior League, we have women of all ages. Andy Ockershausen:	I know that – that’s amazing. Tycely Williams:	Yeah. So you referenced earlier that you’ve known of the Junior League of Washington for quite some time. Tycely Williams:	So you’ve got to be 21 to join the Junior League of Washington, and we also have sustaining members within the Junior League of Washington. So these are women who have given active years to volunteering in the community, and they’ve decided to support the mission by remaining a part of the membership, which their dues really helps to propel our charitable mission. And some of our sustaining members are literally over 100 years old. It’s amazing. Andy Ockershausen:	Well, that is Our Town, though. I’m so glad because I grew up in the days when The Washington Evening Star, the newspaper, was a dominant force in Our Town. Andy Ockershausen:	I mean, way back in the forties, fifties, sixties, and they were, as a company, they were deeply involved with the Junior League because all of their wives of the officers of the Star were Junior League members. I know that will be in roll somewhere. So I would hear about it from there or about them, but I was never really that close to find out what a great organization this is. And it finally dawned on me later, these women are not having cocktails. They’re out working. Tycely Williams:	They’re working. Absolutely, Andy. Andy Ockershausen:	I found that out 50, 60 years ago. Tycely Williams:	Absolutely, and we’re really proud of the great work that we do. So often times people are confused about what the Junior League is, and so the way we describe ourselves, we are women improving Washington. We’ve been in Our Town since 1912, and we have called different segments of the city home. And we’ve been places, Andy, that you might not expect to find a woman of the Junior League of Washington. Andy Ockershausen:	Oh, I believe that. Andy Ockershausen:	Night clubs I would call them. Andy Ockershausen:	The Blue Mirror. Tycely Williams:	Yes, and as she called them, women of the night. Tycely Williams:	Protected and safe. Andy Ockershausen:	And the Junior League did that? Andy Ockershausen:	That’s an incredible story. Andy Ockershausen:	I’ve never heard this story. I’ve been here, been involved with broadcasting and news all my life. I never heard that. Say, fabulous story. Andy Ockershausen:	What they’ve done. Tycely Williams:	We try to meet the needs of the community. You also know the Junior League because of your work with Leadership Greater Washington. Tycely Williams:	So many decades ago there was not a coordinated leadership program within Our Town, and so, members of the Junior League connected with the board of trade. They said, “Hey, this needs to exist.” And so they collaborated, and they’ve created what has become a signature program within Our Town. And Leadership Greater Washington is one of many gifts that the Junior League of Washington has given Our Town. Andy Ockershausen:	Oh, absolutely, and the Junior League became such a big part. I was on the organizing committee and had a great relationship with the ladies of the Junior League. Matter of fact, we had a couple of meetings in your building. We’re talking 1986, to get it off the ground. Getting Leadership off the ground was not easy ’cause people didn’t know what it was. Andy Ockershausen:	But after one year, it became a sell-out almost. People had to be in the program. They had to go through it, and as you know … Did you just finish the program? Tycely Williams:	Yes. Absolutely. Just finished the program in 2018. My class is 2018, Making a Scene. Andy Ockershausen:	Did you go to the … Meet the 19 group? Andy Ockershausen:	I was invited to that. Janey, we didn’t go to that? Why didn’t I go to that? Janey:	It was at a winery, I believe. Andy Ockershausen:	Was that the winery? Andy Ockershausen:	I don’t drink wine. Tycely Williams:	You don’t drink wine? Andy Ockershausen:	Vodka I’d go for, but I’m not going for wine. But Tycely, it seems to me that the things that you have brought up to me, I have never heard before about helping out, but that’s really a grass roots effort when you get people right on the street. Tycely Williams:	And Andy, it connects back to the start of the Junior League of Washington. It’s hard for women like me to wrap our heads around the fact that there was once a time where women, we weren’t allowed to work outside of the home. We could not pursue formal education, and it seems that that is very far removed from today’s reality. But many, many decades ago, the women who started the Junior League as well as the Junior League of Washington, they were looking for opportunities to not only grow but opportunities to improve the community around them. Andy Ockershausen:	Oh, big money raising. I remember that. Andy Ockershausen:	Auctions and so forth. Tycely Williams:	Absolutely. And those women had entrepreneurial skills. Andy Ockershausen:	I don’t make fun of the Mayflower. The Mayflower’s a big part of Our Town. Andy Ockershausen:	And the fact that Junior League used it gave it a lot clout because Mayflower brings clout to the table. Andy Ockershausen:	As Junior League does. Andy Ockershausen:	They work beautifully, but it’s so great to hear these things from you that I probably have heard of all my life, and didn’t realize. They formalize with you, but this is a great conversation. But I talked a lot about the Junior League. We’re gonna take a short break here, come back, and talk about Tycely Williams. Andy Ockershausen:	This is Our Town. In a conversation with Tycely Williams, we’ve covered her career as it is now, but I want to cover her life to go back to this lovely, gorgeous, young woman who was born in Birmingham, Alabama. Tycely Williams:	Birmingham, Alabama. Absolutely. Home sweet home, and you know, in the state of Alabama. Andy Ockershausen:	Who did that movie ‘Home Sweet Home Alabama’? Wasn’t that a great movie? Tycely Williams:	It was a great, fantastic movie. One of my favorites. Andy Ockershausen:	Her first movie, I believe? Wasn’t it? ‘Sweet Home Alabama’? Andy Ockershausen:	She did the ditzy, blonde thing. Andy Ockershausen:	We just love her. Tycely Williams:	I do too. Tycely Williams:	I love her. She’s got lots of sass, which is important. Andy Ockershausen:	But she couldn’t come from Birmingham. She’s probably from Montgomery or someplace. Andy Ockershausen:	But you’re Birmingham born. Andy Ockershausen:	You went to school? Your family is in business? Tycely Williams:	So my dad is originally from Birmingham, Alabama. So my parents met in college at South Carolina State. Andy Ockershausen:	… inside of Carolina. Tycely Williams:	Absolutely. My mother was from a rural town in South Carolina, so they met, married, and dad decided to take his bride back to his hometown of Birmingham. My maternal grandparents were very nervous because Birmingham was not a safe place for little brown people. Andy Ockershausen:	Oh, absolutely. We know that. Tycely Williams:	… different world, and I remember learning that Birmingham was called ‘Bombingham’ just by sharing with people where I was from as I was going to summer camps. While I knew a lot about the Civil Rights Movement, that’s the first time I heard that depiction of the place that I cherish and call home, but Birmingham is a magical and a wonderful place. Andy Ockershausen:	But you were born after your family moved back to Birmingham? Andy Ockershausen:	That you weren’t born in South Carolina. Andy Ockershausen:	They had other children, of course? Tycely Williams:	Yes. I’m the oldest, born a leader literally, Andy. The oldest of four children, I learned how to influence them at a very young age. I loved cornbread and my mother would give every one of us one serving of cornbread, and that’s how I learned my negotiation skills because I had to negotiate with my siblings to get an extra piece of cornbread, and that was always something that brought me a great deal of joy just as it does now. Andy Ockershausen:	To get that extra piece. Andy Ockershausen:	Did she give you the recipe? Tycely Williams:	Whip up a little something, something. Andy Ockershausen:	Janny tried to make some last week and it didn’t work because the flour was bad or whatever … cornmeal. Andy Ockershausen:	But I love cornbread. I love it with this big slab of butter on it, but that’s me. You got three siblings to take care of? Tycely Williams:	Three siblings. I am a divorcée, and I don’t have any children of my own, I have two nieces and a nephew. They’re all lots of fun, and introducing them to Alabama football is probably the highlight of my existence. Andy Ockershausen:	No, I don’t want to hear about the Roll Tide. Andy Ockershausen:	But it’s so overwhelming. Andy Ockershausen:	Because they’re so dominant, I mean it. Tycely Williams:	It’s dominant. Absolutely. But in State of Alabama, Andy, you do know when you were born you have to declare your allegiance. It’s either Alabama Crimson Tide or the other team, The Auburn Tigers. Andy Ockershausen:	And they’re both state schools. Tycely Williams:	They both are. It’s a culture unlike anything I have ever seen. It’s really … unusual would be the appropriate term to use. You see any and everything imaginable tailgating. But it’s a lot of fun. It’s a great way to connect with family and friends. Andy Ockershausen:	It’s a weekend party for … it’s a party school without being a party school, but it’s also academically, a fine university. I know people from Washington that have the means to go anywhere, and they picked going to Alabama for an education. Andy Ockershausen:	I love the Demon Deacons. Tycely Williams:	Demon Deacons. That’s exactly right. Andy Ockershausen:	Well, we have a very dear friend, and we spend the Thanksgiving with him every year, and he’s got more Wake Forest uniforms than the school has. He got it on his shoes, he got WF on his shirt, got it on his jackets. Am I right, Janny O? Andy Ockershausen:	He’s Wake all the way. Tycely Williams:	Rocking the old gold and black. Andy Ockershausen:	It’s a very, very wonderful school, I know that. Andy Ockershausen:	What was her name? Tycely Williams:	Dr. Maya Angelou. Andy Ockershausen:	Oh, a great artist. My God. You knew her in college. Andy Ockershausen:	I hope you stayed in touch with her? Andy Ockershausen:	She is a world class figure of course. Andy Ockershausen:	Angelou. Oh my God. World Class. Andy Ockershausen:	There’s also a world golfer that went to Wake Forest. Tycely Williams:	I bet that we can pair this with our corn bread. You’re talking about lemonade and sweet tea and those good old Arnold Palmers. Andy Ockershausen:	That’s where he invented that drink, didn’t he? Tycely Williams:	He did. He did. Andy Ockershausen:	Arnold Palmer. He never made a dime off it. Did you know that? Tycely Williams:	No, did he not? Andy Ockershausen:	Never made a dime. Tycely Williams:	We’ve got to monetize things. Tycely Williams:	I know, was big a big loss. Andy Ockershausen:	… but he was always … Wake Forest was in his life. Andy Ockershausen:	That’s where he really took up the senior golf. Was when he really got good, but you got good at Wake too because you had good teachers, good experience, correct? Andy Ockershausen:	You can and never get hurt … get involved in everything because it pays off. It is a fabulous thing that you’re doing because it pays off. Andy Ockershausen:	The more you give, the more you get back. Andy Ockershausen:	Your time is valuable. If you give it away, you’re crazy. Get something out of it. Andy Ockershausen:	I get so much of it. Actually, I grew up and people would say to me, “don’t you ever do any work? You’re out all the time. You’re going to cocktail parties, you’re going to party, you’re going to football games, you’re going to grassroots rate, you’re going to meetings.” I said, well, that’s work. Andy Ockershausen:	I’m working it. Tycely Williams:	You are a connector. Andy Ockershausen:	I am a connector. Andy Ockershausen:	It happened to me, and the greatest thing ever happened to me in my life is getting connected with Janice of course, but she is right here, but we have to believe it, and we both believe that the more you give, the more you get back. Tycely Williams:	Absolutely. I want to thank you for being one of those … there’re nearly 63 million Americans that volunteer every year. That’s about 25% of the population, so hopefully through our exchanges we can inspire and encourage other people to join us in volunteering because it’s important. Andy Ockershausen:	You’re so right, and it’s so much of a … I was preaching to you before we were on the air about fundraising. Andy Ockershausen:	It’s been in my experience that it took me my lifetime to understand that the people that give money are the people that give money. There are no others. They all give. Tycely Williams:	That’s right. Andy Ockershausen:	If you spend your time trying to get money from a stone, you’re dead. If you get it from a live person, you can win. Andy Ockershausen:	And I found that out. Andy Ockershausen:	I get turned down a lot. I get turned down a lot, but I get turned down more from people that don’t have any money. Andy Ockershausen:	Oh, you’re so right. Andy Ockershausen:	As a country we give away more than the other countries in the history of the world. Foreign aid goes way, way, way back in our culture. Just to give away, and we do it. We don’t get a lot back for it, but we get a lot of satisfaction. I’m talking to Tycely Williams, and we’re having a great discussion about Our Town and all the great things that go on, and we’re delighted to have you, and we’ll be right back after this break. [Begin Commercials] Tony Cibel:	Hi, Tony Cibel here from Tony and Joe’s and Nick’s Riverside Grill at Georgetown’s Washington Harbor. We’re here to talk to you today about our fabulous Thanksgiving dinner, turkey and mashed potatoes, clams and oysters, desserts. Got to come celebrate the holidays with us at Tony and Joe’s. We can accommodate parties between 10 and 200 people. So now it’s time to call 202-944-4545 to make your reservations. Charles Mann:	Hi, I’m Charles Mann. For athletes like me, playing every down in a pro game is like getting in a car accident. After years of playing football in Washington, my body is broken. I’ve had countless surgeries and joint replacements. I’ve been looking for a nonsurgical treatment since I ended my career. I heard a radio ad for a seminar about alternative treatment. It’s called regenerative medicine, which stimulates your own body to heal and repair itself. No surgery, no more pain. That got my attention. Announcer:	You are listening to Our Town with Andy Ockershausen, brought to you by Best Bark Communications. Andy Ockershausen:	This is Our Town. This is Andy Ockershausen with Tycely Williams. We’ve gotten Tycely through college now, and in the free world, let’s put it, that she’s got to go to work. She has a terrific background, and she got an Executive Masters in Leadership degree from McDonough School. I pronounced that correctly, McDonough? Tycely Williams:	Yes, McDonough School of Business, yes. Andy Ockershausen:	At Georgetown University. I mean, that’s incredible background, Georgetown. From Wake Forest to Georgetown is not a lateral move. That’s an advancement, I think. Andy Ockershausen:	Were you raised a Catholic? Tycely Williams:	I was not. I was raised Baptist. Tycely Williams:	From the deep south, absolutely, was raised Baptist. Andy Ockershausen:	But you found that the Jesuits have something special. Andy Ockershausen:	They are the teachers of the world. Tycely Williams:	They are. They are. Andy Ockershausen:	They were explorers and they brought so much to America, the Jesuits did. So from the University of Georgetown, Georgetown University, you got involved in the private sector. Did you stay in Washington or go back to Alabama? Andy Ockershausen:	Your own company? Tycely Williams:	My own company helping nonprofits raise revenue, something we’ve been talking about today. It’s really important to raise awareness so that charitable organizations can bring in the human and financial resources needed to propel the mission forward. So I’ve been a charitable fundraiser for over 21 years. I absolutely love it. I’m currently working with the YWCA of the USA, so it’s our national office. We’re headquartered here in Our Town. Andy Ockershausen:	Well, where does the Red Cross fit in there? You were Red Cross for awhile. Tycely Williams:	Yes, I was at the Red Cross prior to the YWCA serving as their Chief Development Officer here in the metropolitan area. Tycely Williams:	She [Linda Mathes] is the President and CEO of the Regional Red Cross and has been a fixture here in the metropolitan area for many, many decades. Andy Ockershausen:	I know the name quite well. Tycely Williams:	Fantastic transformational leader, yes. Andy Ockershausen:	Are you in that beautiful office on 17th Street? Andy Ockershausen:	I know that quite well. Tycely Williams:	You know that corner of the world very well, very well. Andy Ockershausen:	McKee Pontiac was on the corner. I know it quite well. Tycely Williams:	You know it quite well. Andy Ockershausen:	The Bijou was around the corner. I know 19th and L.
Tycely Williams:	Yeah, so we’re right there. Andy Ockershausen:	That’s my town. Andy Ockershausen:	Washingtonian Magazine’s right there, on your corner. Tycely Williams:	Washingtonian Magazine is directly across the street. Andy Ockershausen:	They ought to be doing a story on you. Tycely Williams:	Absolutely. Well, we would most certainly be open to that, most certainly be open to that. Andy Ockershausen:	If it’s good for you, it’s good for leadership, it’s good for American Red Cross, it’s good for all your outside activities to know you better. Tycely Williams:	Absolutely. Absolutely, Andy, that is very true. But at the YWCA, I love the work that I’m currently doing, Andy. So I am raising revenue to help us eliminate racism and empower women and we are celebrating 160 years of service this year. Andy Ockershausen:	The Y is? Tycely Williams:	The YWCA has been around for 160 years. It’s also a fantastic organization and it’s really, really relevant at this particular time in our history. It’s wonderful having the opportunity to raise revenue that goes back into local communities, so across the country, we have 210 YWCAs operating in local communities providing direct services. Andy Ockershausen:	My mind says to me, YW is younger, is a younger group. Is that possible? Am I right? For some reason, I’m thinking YWCA is younger? Tycely Williams:	Absolutely. All ages. But we really do have a focus on developing the potential of younger women. Andy Ockershausen:	That’s what I’m thinking. Andy Ockershausen:	You can’t do it without volunteers. Andy Ockershausen:	You’re a lucky person, you realize that? Tycely Williams:	I’m a lucky person. Andy Ockershausen:	What a lucky woman, my God. Tycely Williams:	That’s right. Once the workday ends, there’s no work. Andy Ockershausen:	You’re healthy, you’re happy and you’re in a job you love. Tycely Williams:	A job I love, 24/7. I say it’s morning, noon and night advancing philanthropy. Andy Ockershausen:	You live it. Tycely Williams:	I live it and I love it, so it’s really a privilege. Andy Ockershausen:	Pays off. If you don’t have that passion, you can’t sell anything. We were talking about what’s happened to our world. My world is disappeared because people don’t write anymore. I get people that write notes, that I don’t think ever went to school. But being able to communicate is a blessing that you have and I don’t know whether it’s your family or where, but you got it in spades. Excuse the expression, you are a great communicator. Tycely Williams:	Oh, thank you. Andy Ockershausen:	But you do it in person. I mean, why don’t you get you some television time somewhere, just so people can feel your passion for what you’re doing? It works. You can sell people because you believe in what you’re selling. Tycely Williams:	Oh, thanks, Andy. Well, you know, it comes from the types of exchanges we’re having. Growing up in the deep south, we spent lots of times on a porch and there wasn’t television or radio. You were encouraged to connect person to person and there was oral history and the elders who would recount stories in comical ways. Things were animated and it was just lovely and lively, like our exchange has been today. So I just grew up in a culture that created that type of environment and as a result, I just feel very comfortable connecting with people. Andy Ockershausen:	Yeah, you’re being yourself. That’s easy. You got great, world class training and you didn’t have to leave the porch. That’s an incredible story. But really, you exchange ideas. You can’t do that on a computer. Andy Ockershausen:	You cannot get that passion out on a computer. There’s no body language on a computer. Tycely Williams:	That’s right. I mean, I am so grateful for our exchange because I’m able to see your emotions. I’m able to see your passion because you, too, are extraordinary. You have a gift and this has been a wonderful opportunity for me to learn from you. Andy Ockershausen:	You’re a godsend for Our Town and for our program, but more for what you do for the community. We’re so pleased. I don’t know how they’re going to keep you in Our Town. Somebody’s going to come and hire you for the national, international, who knows, I’d say. But I’m so pleased that you found that we love you love Washington, love Our Town. You obviously love M Street, you love the Junior League and I hope you get to love our program and pass it on to people. We want them to listen. Tycely Williams:	Absolutely. I, too, love our chosen … This is my chosen home. This is Our Town and this is where I’ve decided to hang my hat as an adult and it brings me lots of joy. Andy Ockershausen:	You know, you’re a very young lady and are very important to us. We appreciate you, Tycely, more than you’ll ever know. But we’ve had a great conversation about Our Town and about your work. We hope we have many more conversations. You don’t know, I might be able to help you raise money. You can’t tell. Tycely Williams:	Andy, I’m going to take you up on that. Andy Ockershausen:	And vice versa. Tycely Williams:	I’m going to take you up on that. Andy Ockershausen:	Vice versa. You know, maybe you could help me raise, I don’t know. We don’t need any. I got everything. I’ve got Janice and Ken. I got it all. And now I got you and we’re so delighted that you have been with us today. Godspeed to you. We’re here for you 24/7 in Our Town, Tycely. Tycely Williams:	Thank you, Andy, for all that you do. Andy Ockershausen:	This is Andy Ockershausen. 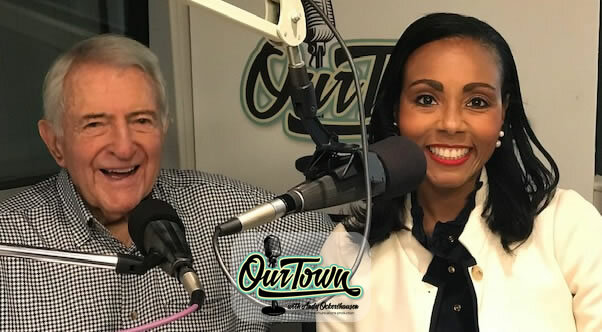 This is Our Town and a wonderful, wonderful conversation with Tycely Williams. Recorded Voice:	You’ve been listening to Our Town, Season 4, presented by GEICO, our hometown favorite, with your host, Andy Ockershausen. New Our Town episodes are released each Tuesday and Thursday. Drop us a line with your comments or suggestions. See us on Facebook or visit our website at ourtowndc.com. Our special thanks to Ken Hunter, our technical director and WMAL Radio in Washington, D.C. and thanks to GEICO. Fifteen minutes can save you 15% or more on car insurance. It is such a joy and pleasure to know Tycely. She is a motivator And such an accomplished young woman. “Our Town” benefits from her presence.